Bronchiolitis is a viral infection due to a RSV (Respiratory Syncytial Virus) and causes the inflammation of the small bronchi. It is a contagious disease which is transmitted via air, nasal secretions, toys and hands. The aim of chest physiotherapy is to reduce grandly these symptoms by using gentle manual techniques and to help your baby get rid of the accumulation of mucus in their chest and nose, in order to get better, feel better, eat and sleep better. At Baby Physio London, our paediatric physiotherapist will provide your baby the best baby respiratory treatments by using modern chest physiotherapy, which is safe and gentle for your baby. Our team is composed of the best paediatric therapists in London. Chest physiotherapy has been Baby Physio’s speciality for more than 15 years. Bronchiolitis physiotherapy treatment, chest physiotherapy to treat bronchiolitis in London at home or at our practices in Belgravia SW1 (Westminster) and in Clapham SW4. We offer paediatric chest physiotherapy for bronchiolitis at home in London, in order to make your baby feel more comfortable and also to avoid any risk of contamination for them. If, however, it is more convenient for you to come to one of our practices, our paediatric physiotherapist can see you at the Light Centre Belgravia SW1 in Westminster near Victoria Station, or at Make Me Feel Clapham SW4 between Clapham Common and Clapham South stations. Bronchiolitis is a common infection. However, it must be taken seriously because in some cases, the child can develop a lack of oxygen and may have to be admitted to a hospital with respiratory distress. The illness generally lasts between 10 and 15 days and the cough often persists for a few more days. The first phase is generally called “the dry period”: the baby usually develops a dry cough and a wheezy breathing. This is followed by the second phase of the disease, which is called “the wet period”. Baby starts to secrete mucus and the cough becomes wet. This is the phase when the daily chest physiotherapy is the most necessary and effective. What can chest physiotherapy do to treat bronchiolitis? The baby will often feel weak during bronchiolitis. 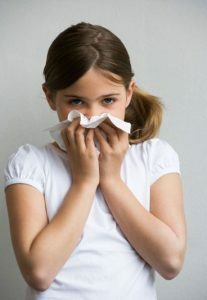 This happens because mucus interferes with breathing, which reduces appetite and sleeping hours. Chest physiotherapy helps clear the lungs and respiratory ways, allowing the baby to breathe and sleep better, and to increase their appetite. It also helps avoid further pulmonary infections. Chest physiotherapy will considerably reduce the duration and the intensity of the illness: you and your baby will certainly appreciate the benefits, especially during night time. Are you suspecting a bronchiolitis? If you think your baby has bronchiolitis, it is best to consult as soon as possible; either your paediatrician or directly our physiotherapist who will make a diagnosis and will contact your doctor if necessary. It is always advisable to deal with the bronchiolitis as soon as possible to avoid any further viral infections. Your baby will be happy if you take care of the disease in time, because that will considerably reduce the duration and the intensity of the illness. How does a session with chest physiotherapy work? A chest physiotherapy session starts with a conversation between the therapist and the parents to determine the frequency of the cough and how the baby is sleeping and eating. After the assessment, the physiotherapist listens to the baby’s lungs with a stethoscope. This will allow them to find the location, the amount and the density of the mucus (whether it is thick or fluid). With all these informations, the physiotherapist will be able to make a diagnosis and to decide about the rhythm, the frequency and the intensity of the massages. The physiotherapist will start by cleaning the baby’s congested nose with a saline solution and a small pump. While doing this, they will explain to you how to do it yourself, as you will have to repeat it several times during the day. The physiotherapist will then apply one hand on the baby’s belly in order to compensate his abdominal weakness, and his other hand on his chest. The physiotherapist will follow the baby’s respiratory rhythm with the hand on the chest and will accelerate the expiratory flow. This will force the mucus up to the throat. Once the mucus is in the throat, the physiotherapist will stimulate the baby’s cough reflex, which will then expel the mucus. Repeating this action will clean your baby’s lung from the mucus and will allow the normal oxygen flow from lungs to blood. This technique is efficient and painless for babies; as the ribcage is still formed with cartilage and is very flexible, it allows the physiotherapist to use this technique without any risk. Cleaning the mucus from the lungs is a big relief for the baby, who will then be able to eat, breathe, and sleep better. Chest physiotherapy will also reduce the length of the illness by more than half, as it will allow the baby to use their energy to fight the illness instead of using it to get rid of the mucus. We are covered by health Insurance companies and recognised by Bupa Uk and Axa PPP. Wash your hands as well as the siblings’ hands before handling the baby. Elevate the head of baby’s bed approximately 30° with the help of a cushion or a similar item. Keep the room ventilated at the temperature of approximately +19 °C. Regularly clean the nose of the baby: most importantly before meals and bedtimes. Divide the feeding bottle into a few portions instead of giving it all at once. Offer him/her water regularly throughout the day. Often humidify the room with the help of a room humidifier, especially during the first phase of the disease. Do not take the baby into overly crowded and enclosed places; avoid public places such as shopping centres or public transport. Avoid taking the baby back to the nursery or to the kindergarten as long as possible during the time of the illness. How can I prevent bronchiolitis contamination for my baby ? Wash your hands with water and soap, for at least 30 seconds before handling your baby. Do not kiss your baby’s face. However, you can still kiss the belly and the feet. Do not take your baby into overly crowded and enclosed places, avoid the public places like shopping centres or public transport. Wash the siblings’ hands and change their clothes on return from school or nursery. Do not allow relatives and friends to handle your child during family celebrations. Regularly wash your child’s nose in case of cold. Carefully clean and sterilize pacifier, feeding-bottles, lollipops, spoons and toys. Delay returning the child to the nursery as much as possible. Is a chest physiotherapy session painful? Why does my child cry during the session? It is important to remember that the session is done when baby is sick, weak, and often has fever. However, although difficult for the mother, tears increase the effectiveness of the session, because this way baby breathes with the entire lungs and is able to exhale without any obstruction in the airway. Will my child be asthmatic if he often has bronchiolitis? An asthmatic child will certainly have bronchiolitis more often, although a child who is often ill with bronchiolitis may not necessarily be asthmatic. Asthma is diagnosed only later in his life so there is no need to worry just yet. However, there is a possibility of an infantile asthma, which disappears later in adolescence. Will my child have after-effects following a bronchiolitis? No. Although to it must be taken seriously, bronchiolitis is a minor illness and will not have any consequences for the respiratory future of your child.